Who were the Sudras And how come to be the fourth varna inf the Indo-Aryan Society. The Buddha and His Dharmma. ↑ Pritchett, Frances. "In the 1900s" (PHP). http://www.columbia.edu/itc/mealac/pritchett/00ambedkar/timeline/1900s.html। আহৰণ কৰা হৈছে: 5 January 2012. ↑ Pritchett, Frances. "In the 1940s". http://www.columbia.edu/itc/mealac/pritchett/00ambedkar/timeline/1940s.html। আহৰণ কৰা হৈছে: 2012-06-13. ↑ 3.0 3.1 3.2 3.3 3.4 3.5 3.6 সমীন কলিতা. ভাৰত-ৰত্ন. অজয় কুমাৰ দত্ত, ষ্টুডেণ্টচ্ ষ্ট'ৰচ্. পৃষ্ঠা. ৮৪,৮৫,৮৬,৮৭,৮৮,৮৯,৯০. Beltz, Johannes; Jondhale, S., eds. Reconstructing the World: B.R. Ambedkar and Buddhism in India. প্ৰকাশক New Delhi: Oxford University Press. Jaffrelot, Christophe (2004). Ambedkar and Untouchability. Analysing and Fighting Caste. প্ৰকাশক New York: Columbia University Press. Gautam, C. (May 2000). Life of Babasaheb Ambedkar (Second সম্পাদনা). প্ৰকাশক London: Ambedkar Memorial Trust. Kuber, W. N.. Dr. Ambedkar: A Critical Study. প্ৰকাশক New Delhi: People's Publishing House. Bholay, Bhaskar Laxman (2001). 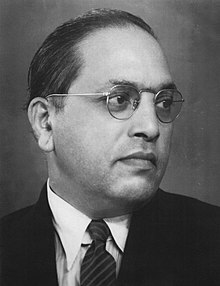 Dr Dr. Baba Saheb Ambedkar: Anubhav Ani Athavani. প্ৰকাশক Nagpur: Sahitya Akademi. Kasare, M. L.. Economic Philosophy of Dr. B.R. Ambedkar. প্ৰকাশক New Delhi: B. I. Publications. Ahir, D. C.. The Legacy Of Dr. Ambedkar. প্ৰকাশক Delhi: B. R. Publishing. ISBN 81-7018-603-X. Ajnat, Surendra (1986). Ambedkar on Islam. প্ৰকাশক Jalandhar: Buddhist Publ..
Fernando, W. J. Basil (2000). Demoralisation and Hope: Creating the Social Foundation for Sustaining Democracy—A comparative study of N. F. S. Grundtvig (1783–1872) Denmark and B. R. Ambedkar (1881–1956) India. প্ৰকাশক Hong Kong: AHRC Publication. ISBN 962-8314-08-4. "Pakistan or the Partition of India". http://www.columbia.edu/itc/mealac/pritchett/00ambedkar/ambedkar_partition/index.html.